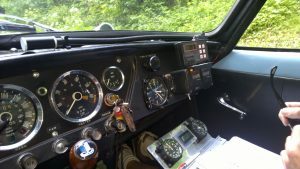 The Viper's Nest – A Little Triumph 4 Women in Historic Rallying! 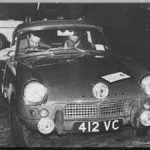 A Little Triumph 4 Women in Historic Rallying! Restoring more than just a reputation! Author viper467Published on 21st March 2017 4th April 2017 Leave a comment on Restoring more than just a reputation! 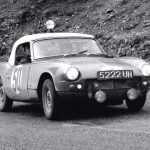 In this blog I will attempt to record the trials and tribulations of restoring a 1964 Triumph Spitfire 4 to a condition that celebrates, and hopefully enhances the rallying heritage of ADU467B. This car was unique in many ways. 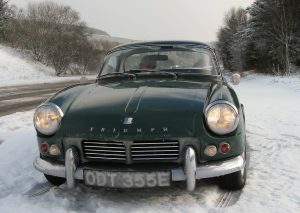 She was prepared by the Triumph Works Dept and Stirling Moss Automotive Racing Team ( S.M.A.R.T.) 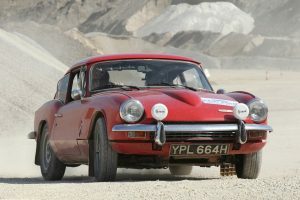 for Val ( "Viper") Pirie who competed in UK and International Rallies in 1964 / 65 with very modest success. 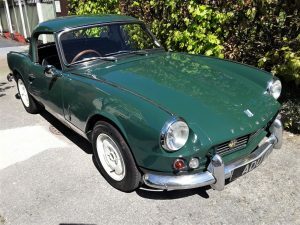 Graham Robson, Triumph's one time Competitions Manager is in fact so critical of Val Pirie's contribution to the competitive history of small triumphs - I feel duty bound to restore not just a car but some reputation! Many works rally Triumphs have already either been restored or have had replicas built. Whether these be Standard 10's, TR4's, 2000's, Dollies or the Wedgewood Blue GT Lemans Style other Rallying Spitfires - but non have yet tried to revive and promote the contributions to 1960's British Rallying made by women. In building this "evocation" of Val's car, I hope eventually to have a car eligible to compete in today's Historic Rally Car events. 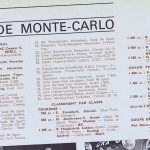 Wouldn't it be great to see such a car race again around the roads used by The RAC, Alpine and Monte Carlo Rallies! In later posts I hope to re tell the tale of this particular car and record the details of our reconstruction. Partnering me in this project is Mark Field of Jigsaw Racing - who in addition to rebuilding and re racing the Le Mans Spitfires has also already restored ADU 7B - arguably the most successful of the small rallying Triumphs. Published on 21st March 2017 4th April 2017 Leave a comment on Restoring more than just a reputation! It's been done before. Here I'm indebted to Daniel Senn for the facility to link to his photo journal of his own restoration and recreation. I only wish there was some text to add details and specifications. If you know Daniel please ask him to get in touch. We can't all afford to own an ex works rally car - even for our modest cars - genuine ex works cars are highly desirable and cost serious money. However here is an example of what can be achieved with enthusiasm, dedication and - what still amounts to a whole lot of money! Well done! - a true inspiration and a car I hope one day to be able to see in action. "On the road to Monte!" It was also an opportunity to take ODT on her first event - given that I hope to create a tribute to JJ Thuner by morphing her into an evocation of his 1965 Monte Carlo Rally car - taking part in 2018 Monte Heritage run from the start at Paisley Abbey down to the first check point at The Auldgirth Inn, Dumfries - this was an interesting start to her new career as a road rally car. The event has a wonderful atmosphere - and credit here to the organising committee - especially Douglas Anderson - who ran his Herald Coupe as Car 0 - the Course Opening Car. A father & son Polish team brought their purposefully acquired 1200 ... looked a little humble parked alongside a vintage Triumph Gloria "Monte Carlo"
360 odd miles round trip was a winter shake down that killed the overdrive and exposed the frailties of untested ignition systems when confronted by puddles of slush. Still we are part of Club Triumph - the club that does. My many thanks to Mr M my very own on board mechanic. Wishes of Good Luck to all those taking part. ... And if anyone reading fancies taking part in 2019 please get in touch ! Please click pictures for full view. The history of rallying small chassis Triumphs is a fascinating story of incremental gains, motor evolution and a fusion of daring driving and brilliant engine development. So exciting were the advances in automotive engineering and so competitive the rivalry between different marquees I suppose we shouldn't be surprised that some enterprising enthusiasts sometimes jumped the gun! Arguably our wee cars have achieved as much success in the hands of individuals & semi privateers as they did within the official "Works" program. 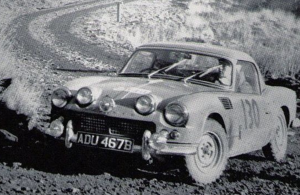 I had until recently thought that Roy Fidler and John Hopwood's astounding 2nd Place Overall on the 1964 Welsh Rally was where the rallying pedigree of the Triumph Spitfire had begun. That was until I purchased vol. 6 of Frederic Reydellet's "Triumph en Competition". Oh how I rue bunking 4th form French - this mighty tome of Triumph Trivia is a gold mine of erstwhile undiscovered information. 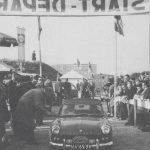 The first two pictures are from April 1963 and are taken on The Tulip Rally. Here we see individuals recognising the nimble maneuverability and improving horse power of the Spitfire to begin campaigning before the works department. In the GT Category Lloyd & Masters came 15th & Rooijen & Nijhof 20th. 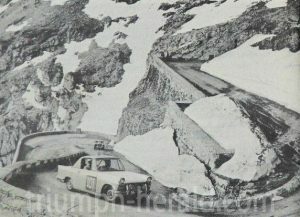 This of course was also when Works Triumph TR4s took the Team Prize by coming 4th, 6th & 10th in the same Cat. The large number of entries and complex class improvement formula on the Tulip Rally often created some surprising results. 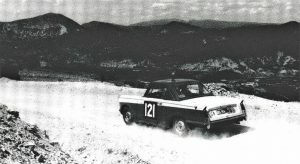 In 1961 The Rally was actually won outright by a works replica privateer team of Geoff Mabbs & Leslie Griffiths driving YRW 266, a 948cc, 1959 Herald Coupe. It could be contended that 1959 was indeed the true beginning of several small Triumphs. 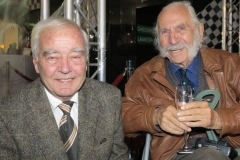 The year I was born saw motor trader Ian "Tiny" Lewis work closely with Triumph's Ken Richardson to turn one of the first Heralds manufactured into a modest yet instantly successful rally car. 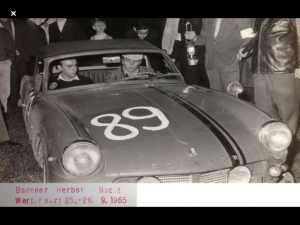 Plated TL5 "Tiny" & Tony Nash pushed the little Herald through 2400 grueling miles to win a Coupe des Alpes and take 3rd in class & 9th overall on the prestigious Alpine Rally. 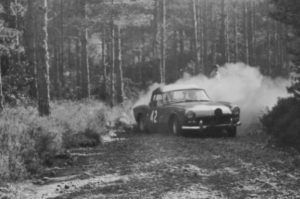 Author viper467Published on 22nd September 2017 Leave a comment on Out Rallying This Weekend? It's The Hero Challenge this weekend - a round of the HRCR National Championship. I doubt there'll be a Spitfíre. Next year maybe! 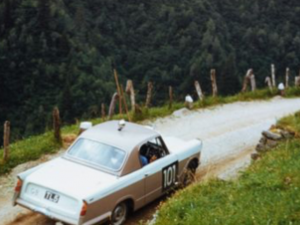 Such period photos as this I find so evocative of the thrill that classic car rallying brings. 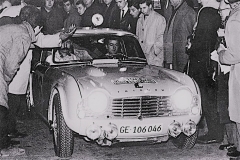 Partly through the success that our little Triumphs had on rallies in France there seems to have been a more active cadre of amateur rally drivers on the continent than here in the UK. 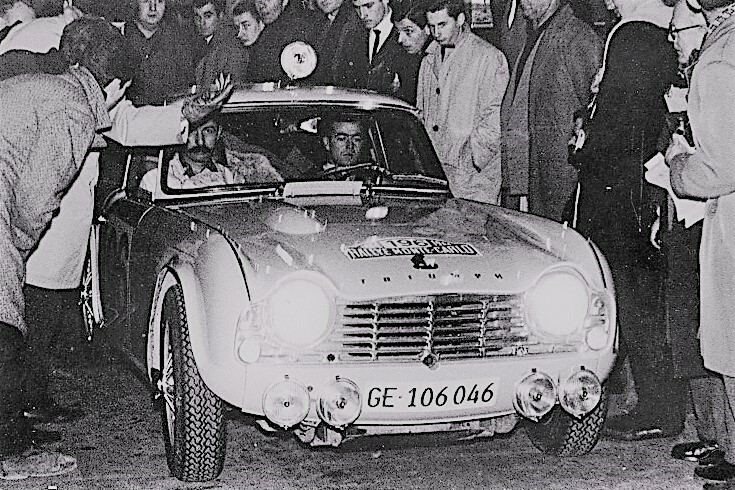 Love the reset ancillary lights - I guess it was colder on night rallies then and over heating was not such a problem. Do please comment if you can share any info about this picture. Published on 22nd September 2017 Leave a comment on Out Rallying This Weekend? Author viper467Published on 9th September 2017 9th September 2017 Leave a comment on Wrong Slot ! Ever wrong slotted - but enjoyed the ride anyway? That's just what seems to be going on right now. I've somehow ended up with a car I swore I would never buy... funny how our passions have a habit of overtaking us on the verge. So, for a short while at least Project Viper has become Project Thunder... as the car I've bought although RHD is much closer to making an evocation of JJ Thuner's 1965 Monte Carlo Rally Car than it is to becoming the Viper. The basis for this "Project Thunder" is a very tidy MKII Green Spitfire purchased off Andy Jones from North Wales. Previously registered ADU 1D it is a car that has been worked on extensively by Mark Field from Jigsaw Racing Services. Sold minus it's Lemans wheels, registration plate and attractive steering wheel it doesn't now look quite so grand - but in time I hope she'll enjoy a more active and exciting life as a tribute car to arguably the most successful Triumph Rally driver ever! 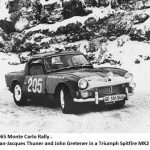 Jean Jacques Thuner - I dedicate this "endeavour" to you and your great friend and co- driver, John Gretener. Published on 9th September 2017 9th September 2017 Leave a comment on Wrong Slot ! I'm indebted to my friend Rowena for assisting me in easing back into some rallying. We were a new pairing and it showed - but with hiccups at scrutuineering (clearance of steering column to Phoenix 6-3-1 manifold) several wrong tests through poor team communication, AND a small breakdown; coming last - in front of several dnfs, seemed like quite an achievement. Anyway it was great to be back amongst some historic rally cars on the recent Ilkley Jubilee Run on which photographer Phil James snapped this dusty shot of Greta getting lost in a sand pit! It is the thrill of such adventures that spurs one on. It's strange where our love of cars takes us. It's strange what its takes to register your mark or to define your identity! In seeking to create an invocation - ( I hate this word - so from now on I'm going to refer to The Project Viper Car as a Replica - and leave the pedants to squabble over the exactitudes that needlessly ensue... However) ,.. In building a replica one would like a registration plate that is similar to the car one is invoking.... The original Pirie car was sold to Peter Cox and was extensively modified by him and Richard Lloyd. She became part of the Gold Seal Racing Team's success ( more in later posts ) and ended her days a chimera of different bits - of which I believe Dave Pearson now has the surviving Glass Fibre body tub. Oh how lovely it would be to have that V5, the chassis plate, etc with which - like some kind of automotive stem cell technology - one might recreate the identity of its conception! ADU467B reborn - a triumphant restoration of car ... and reputation. An ADU ***B would be ideal - but how does one achieve such things? The DVLA's records were extensively revised in 1983 but cars not listed then may still be re-registered - provided sufficient documentary evidence can be produced using form V765.... for the time being I'm hoping to find a chassis with a verifiable identity - similar enough to do the job. How jealous then to find the Swiss have car number plates that are "Nominative" - i.e registered to the individual - not the car. Feast your eyes on JJ Thuner in three separate Triumphs all with the same identity. And I thought I had problems! 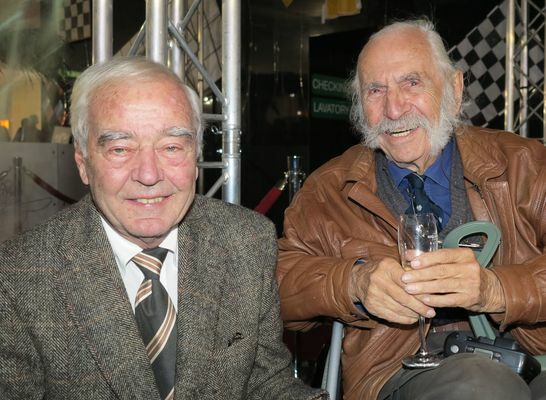 More in later posts about this incredible driver & his regular navigator J Gretener - together they rallied triumphs - of many kinds, throughout the 1960s. 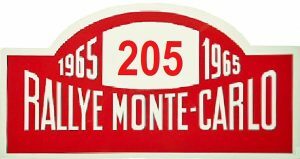 IMHO all pictures are of entries into The Rallye Monte Carlo - can you name the year and the classification? 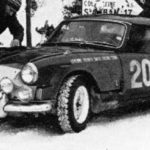 Wouldn't it be great to do such a Club Triumph Team entry in a future Monte Historique! Dreams have a tendency to remain just dreams until some impulse shocks them into life. There is a moment when they erupt from the corners of our minds into a stark and pulsating reality. With Project Viper this occurred one winter's night early in 2017 when an idle internet search stumbled upon the availability of a good RHD Spitfire 4 available for restoration. ... In Germany...! Contacting Rolf I found that although not yet sold, someone from the south of England had already made arrangements to fly and view that coming weekend. 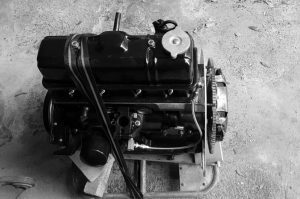 The disappointment at being beaten to what could have been a good basis for a project was sweetened just a little when I learnt that a Jigsaw Racing prepared 1296cc engine was also available with weber carbs and appropriate inlet manifolds. And so a tachycardic rhythm of emails, phone calls began - that has today resulted in shipping being arranged to return this tuned engine to the very workshop in which it was built. Late in 1965 the Triumph Works Dept experimented with switching from the 70x 1148cc engines to 1296cc tuned units. On this basis, Project Viper will have a Stage Two tuned engine similar to those available for the MKIII Spitfires of 1967.